If you are also very eager to know it all about the Honda Amaze India, just bookmark this page and keep checking every few days. We will keep updating all the Amaze launch related information and details which are revealed about Honda Amaze on this one page here. Keep watching our updates. Honda Cars India has officially launched Honda Amaze with a starting price of Rs.4.99 Lakhs ex-showroom Delhi for the base petrol variant. The base diesel variant starts at Rs. 5.99 Lakhs. Click here for complete details on variants and pricing along with Video review. As per recently revealed information from reliable sources, the 1.5 Litre Diesel engine of Honda delivers 25.8 KMPL of mileage as per ARAI figures under standard test conditions. This mileage is so far, the best in segment after the Indigo eCS which delivers 25 KMPL. Not only it’s the best in mileage, but considering performance numbers of 100 PS peak power and 200 Nm of torque, its also best in class. The launch is scheduled for 11th of April 2013 when the prices will be revealed. We are expecting a pricing of Rs. 5 Lakhs for the petrol and Rs. 6 Lakhs for the diesel base models. Honda Cars India is doing a media test drive in Goa for selected group of journalists and media and some details have been flowing out from twitter from there since morning. One of the most useful information revealed so far is that Honda Amaze diesel will deliver a whooping 98.6 BHP of peak power at 3600 RPM, also the torque levels are close to 200 Nm. Not only does it make the Amaze more powerful in the segment, but also Honda claims that Amaze Diesel will be the most fuel efficient in the segment too. Honda Amaze, the first car from the stable of Honda to reach the Indian shores with a diesel motor will get launched this April. So if the car is going to be launched within less than a month, it surely would have reached the dealerships before the official launch. And that is precisely what has happened. Today we have for you the spyshots of the Honda Amaze adorning a dealership in the country in the top end VX trim in petrol guise. The car which you see here in the images is the car that the dealerships usually receive preceding the launch of the car which is sent for training the staff so that they can understand the car better which will translate into better sales. Team-BHP.com has showcased these pictures and what can be made out as a difference from the Indian and Thailand-specific Amaze is that the Indian version would have a higher ground clearance as the car will have to go over a lot of potholes in the Indian market. Also the car will have body coloured bumpers and the front of the car will come with a chrome grille that is slightly different from the Brio. The pictures are a proof of the car having completed ARAI testing process and starting to reach the dealerships. 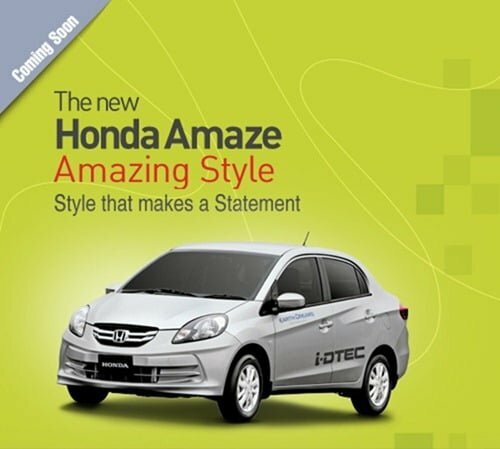 The Amaze will be launched some time in April and the car is expected to turn around Honda’s fortunes in the country. The car will also get an optional automatic transmission. The Amaze will come in both diesel and petrol guises. The details of the diesel engine are still scarce but the 1.5 litre i-DTEC is expected to have a power output in the range of the 85-90 BHP but Honda might pull a bunny out of the hat and give this engine a power output somewhere in between 90-100bhp to make this car a stellar performer. The Swift Dzire which is the country’s bestselling sedan and also the Amaze’s main competitor, now has a plenty of reasons to worry about. Now that slowly the news surrounding the EcoSport are dying down since the car is almost like a regular car on the roads as of now, a car which will surely create a lot of waves in the coming months will be the Honda Amaze and some of the features on the car have skipped on to the interweb. Honda is believed to have started sending the Amaze to the dealerships in petrol guise following which the car would be launched in April. The Honda Amaze will have a ground clearance of 165 mm and the heart of the car will be a 1.2 litre petrol motor and a 1.5 litre i-DTEC diesel motor. The petrol motor is expected to be the same one that powers the Brio which will give out 87 BHP. The power output of the diesel motor is still in question but it is believed that it will be between 80-90 BHP. The dealers are being told that the diesel motor will have a fuel efficiency of 23 KMPL as per ARAI. Since the mileage is as per ARAI, that means Honda has managed to keep the testing of the car under the wraps. 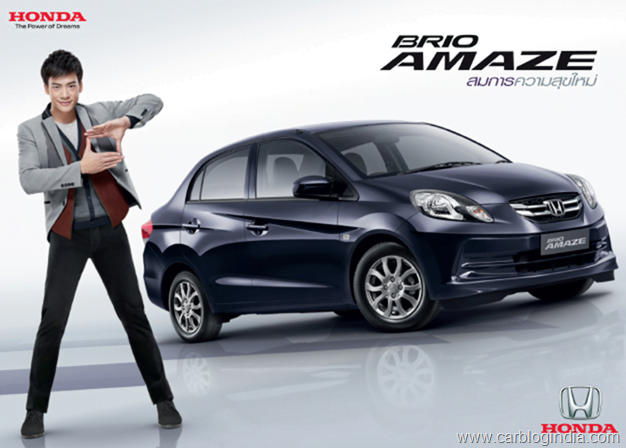 The Brio will have a boot space of 400 liters which is 84 liters more than the Dzire. The top of the line model will be in VX trim which will also be introduced on the Brio. It will come with all the bells and whistles and will come with 14″ alloy wheels with manual air-conditioning. It will get all the safety equipment and will come with dual airbags to save your life and ABS and EBD to bring the car to a halt. ORVMs will get integrated blinkers with the rear seat getting a central armrest. There will be a rear defogger as well on offer which will also make its way on to the Brio we believe. The car will come in White, Silver, Black, Blue and Red colours and some dealers have even started accepting bookings with the car deliveries due to start in April. We believe that amount of information would surely make you set your eyes on the Amaze and it will be quite the class leading car once it gets launched officially. Honda Cars India have discontinued the production of its premium hatchback, Honda Jazz at their Greater Noida assembly plant. 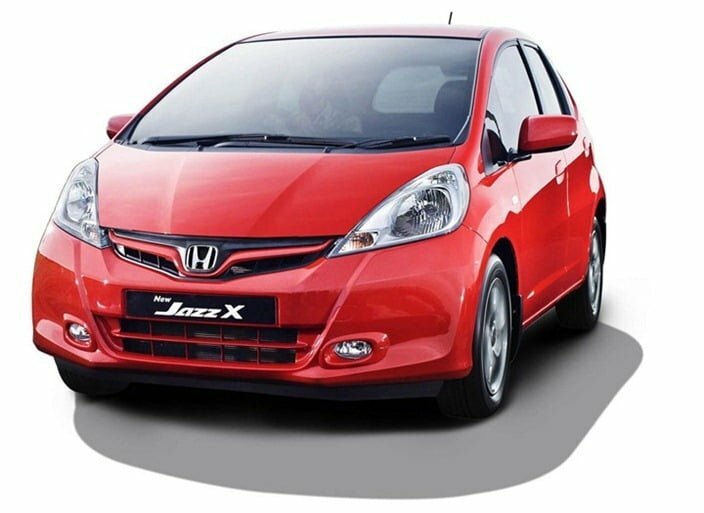 Honda has cleared all the existing inventories at the dealers end too and dealers have also stopped taking any fresh bookings for the Jazz. 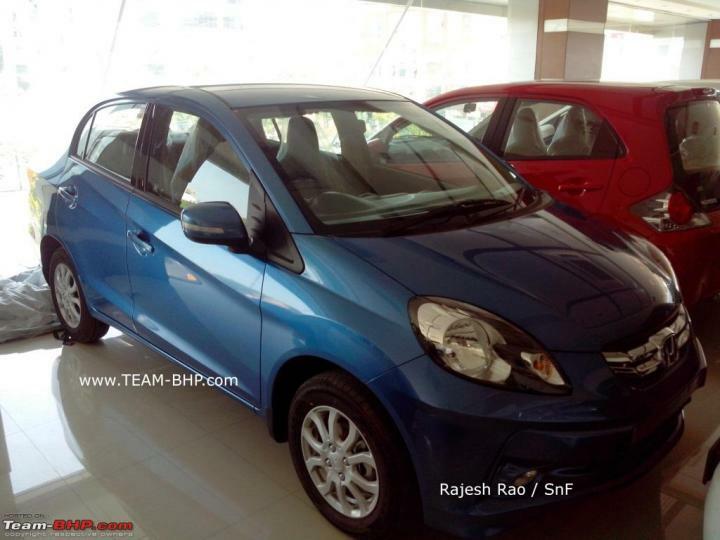 The refreshed Jazz was launched just more than a year ago with a price slash of close to Rs. 1 lakh compared to the older version. The older version was not a very favorite model among the customers due to its premium pricing. however, it garnered quite a fan following after the price cut and has been selling better ever since. Seeing this, it comes as a surprise to us to see Honda obliterating the model from the Indian market now. Honda says there are a couple of reasons why it had to go to this route. 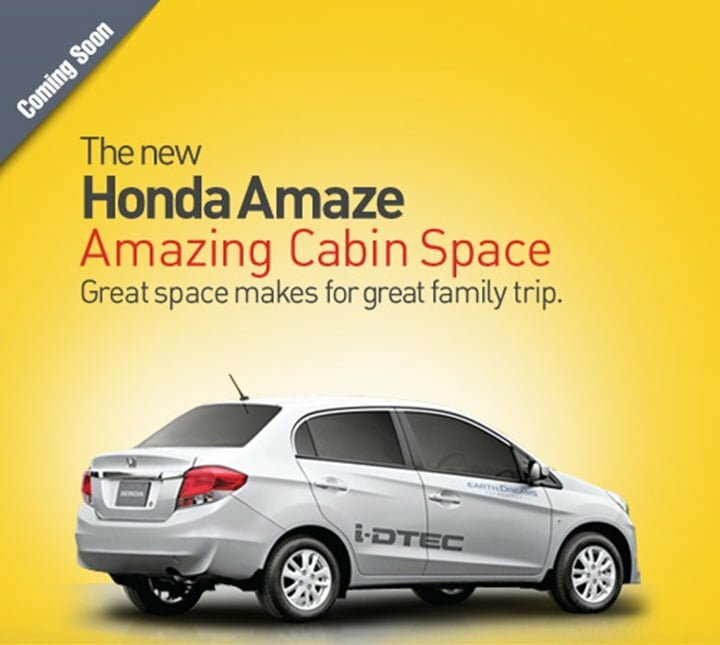 Firstly, the company wants to make space for the upcoming Honda Amaze models which it is putting a heavy bet on. The Amaze sedan has been developed keeping India specially in mind and the company cant afford to lose any market on that. Honda has shifted its focus recently to the volume-selling small car segment (Brio hatchback and Amaze sedan) to increase its strong foothold in India. secondly, Honda was making a loss on the latest Jazz models it was selling. Although, the price cut was announced to garner fresh demand, the localization of components was not achieved to that extent to make it even break-even at that price point. This led to high demand for the model but low turnover from the plant. The Jazz fans shouldn’t be disappointed although. Honda has confirmed that it will be bringing in a new Jazz model later which will have higher levels of part localization. 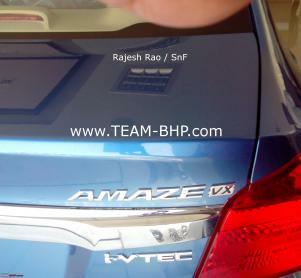 It will also get the 1.5 litre i-DTEC engine that will debut in India on the Amaze sedan. Expect the all new Jazz to be hit the Delhi Auto Expo in 2014 and going on sale in the market by the middle of 2014. Honda also has new 2014 Honda City and 6 more cars lined up for India in coming 2 to 3 years time. With the launch of first diesel engined car Amaze in April 2013 in India, Honda India will enter the league of Diesel car makers in India who have taken huge share of sales because of increased demand for small diesel cars in India. It will be interesting to see how it will affect the overall market share of the majors like Maruti and Hyundai who have dominance on Indian car market. Stay tuned to Car Blog India for more updates. And finally it’s here. After countless speculations and months of waiting, the Honda Amaze has touched down on the Indian shores and has reached the authority which will certify for hitting the roads- ARAI. Our friends back at IndianAutosBlog.com have told us that they have sources who have confirmed this news. The car has reached Pune for homologation process and you will soon see the car being tested in Pune and do we need to say it will lead to the spy-shots making their way to the interweb. Honda Brio has been the car which has spawned the compact sedan Amaze and since it will be less than 4 meters in length, it will be eligible for that lucrative tax benefit and Amaze broke cover on the November 23rd in Thailand where Honda invited some media persons to give the world a small insight into their mass market car. And the car has been receiving applause since then for the drivability and rear seat comfort on offer from the Honda Amaze, courtesy the media which has simply loved the car and it’s practicality aspect. 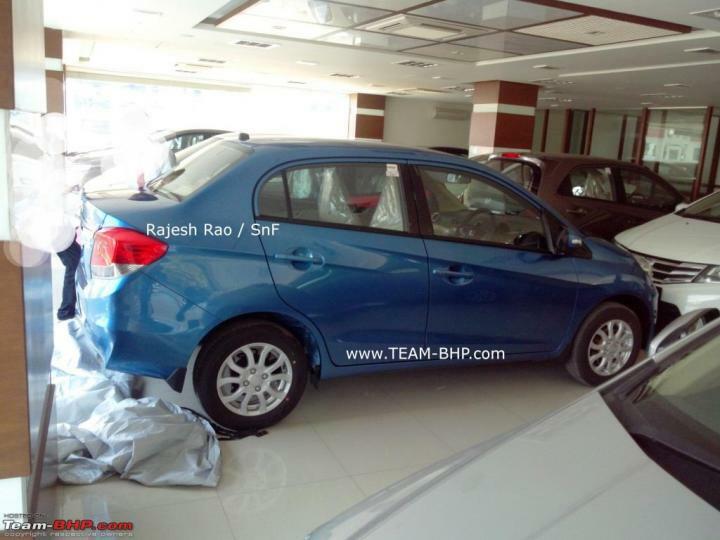 The car will borrow its front fascia from the Brio and the 1.2 litre petrol motor from the hatchback version will be carried to the sedan as well. But the engine that will bring the maximum number of walk-ins that Honda would have ever noticed would be the 1.5 litre iDTEC diesel motor which will be the first diesel from the petrol-head Honda in India. The car will be mated to a 5 speed manual gearbox but the petrol motor would also get an automatic gearbox which will be borrowed from the City. The car will have its arch rival in the form of Maruti Suzuki Dzire CS which manages to sell a north of 10,000 units every single month and is the third bestselling car in the country. So even though the product from Honda seems to be a compelling buy, the car will somehow have an uphill task going head to head with the segment leader which sells well despite the car being awkward to look at to say the least. And before you forget, the Verito CS and Manza CS’s launch is also impending so the Amaze will have to be quite an amazing car to get the momentum going.